Commonspoly, the Monopoly game where building capital, ultimate wealth and sneaky bargaining are not crucial, but the commons, sustainability and public values. Are you done with the dominant story about the market, profit maximization and economic growth? Are your values ​​incompatible with ‘buying the Main Street, tolls and exploitation’? Do you see initiatives arising from sustainability, community and public values ​​that are difficult to place within the predominant financial economic discourse? Common play with us! During this old-fashioned game night, you will meet the board game Commonspoly. The alternative to Monopoly, was launched during ZEMOS98 festival hackcamp in Spain and then further developed during Commons Fest in Athens. The game is published under Peer Production License and freely downloadable. We are very enthusiastic about the game. The only problem is: it is very complicated to play! Do you want to work with us on a version of the game Commonspoly that is easier to play? While enjoying a drink you can get to know this alternative to monopoly, discover the concept of the commons and you are challenged to use your creativity, gaming experience and clear mind to raise Commonspoly to a higher level. Commons are shared resources, managed by a community from the perspective of sustainability, inclusiveness and public added value. They offer room for bottom-up initiative and citizens’ own directing. With the Chamber of Commons, Waag generates insight into contemporary commons and brings new forms of commons into practice. Co-operation is central: organizing a shared and balanced interest between different parties. 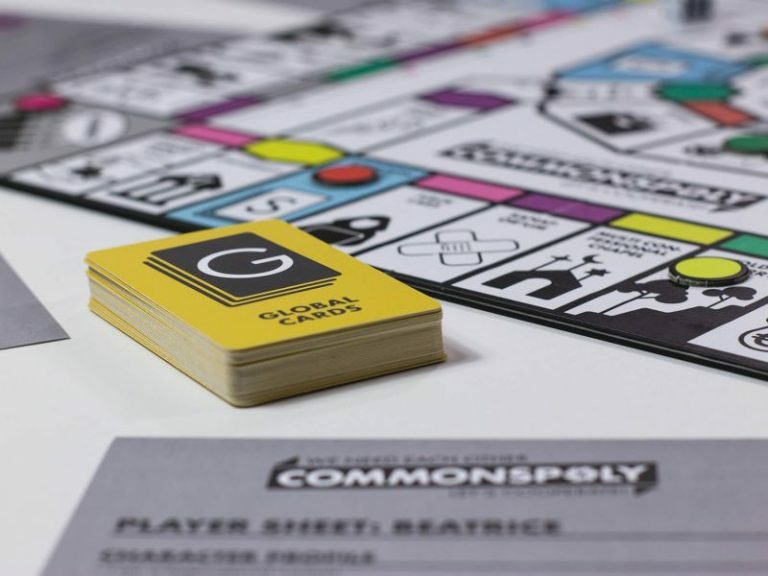 Commonspoly turns modern Monopoly upside down and returns to the basic principle of the original game; to propose a viable world based on cooperation rather than competition. Not everything is perfect, however. You will have to fight against The Speculators. In this game we are fighting against the clock! And the help of each player is needed and welcome, because there is only one way to win: by helping each other. We have urban, health, environmental and intangible communal goods to preserve!